On Saturday, a letter was revealed that General Electric sent to all air carriers saying it was seeking to remove an engine part from service after an American Airlines plane caught fire last week. 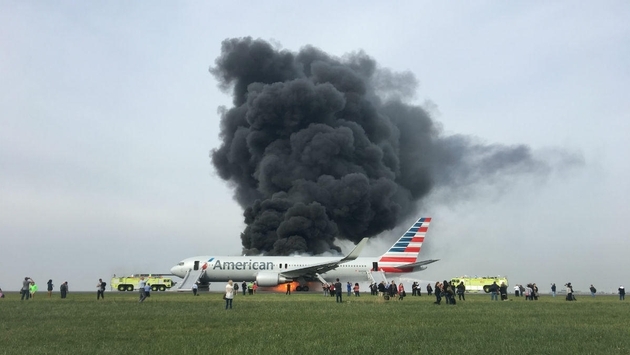 According to Reuters.com, the letter from General Electric said there is a limited number of engine parts that have a material anomaly which is believed to be one of the causes of the American Airlines fire at Chicago's O'Hare International Airport in October. The incident took place on Oct. 28 when American Airlines Flight 383 from Chicago to Miami was forced to abort takeoff due to an engine failure. Pieces of the engine which broke off caused a fuel leak that resulted in a fire, but thankfully no passengers were seriously injured. A General Electric spokesman named Rick Kennedy confirmed the company is in the early stages of an intense investigation, and officials from the United States National Transportation Safety Board are also involved in the case. While NTSB investigators have not assigned blame for the plane fire, they did reveal that a “stage 2 disk in the engine” showed signs of cracking. The material which made up the disk likely indicated a manufacturing defect, causing the decision to remove the engine part from service. General Electric has stressed the reliability of the CF6 engines—like those used on American Airlines Flight 383—which have flown more than 400 million hours since the 1970s. A spokesman for American Airlines revealed that none of the company's aircraft in operation had the additional parts that GE referred to in the letter, but said the airline is working with the NTSB to further examine the incident.